Need custom fabric treatments such as draperies, pillows, cushions, valances, table cloths, or bedspreads for your home? Done. Need a chair reupholstered or want one built from scratch? Done. Own a restaurant or bar that needs to be outfitted with durable hard-use décor or accouterments? Done. Need to outfit a fancy, post-Academy Award party? Done. The skilled workers at Foam’n Fabrics create jewels of commercial and residential goods that are only limited by an imagination. A combination of showroom and workroom, This village business is squeezed into a single story building near the southern border of San Clemente. Bolts of indoor and outdoor fabric bloom from barrels in every corner and greet visitors at the front door. Massive blocks of foam are stacked in the center of the main room. Lining the walls are rolls of cotton, velvet, denim, silk and every kind of fabric. Hanging adjacent are fabric swatch books - spine to spine - by Kravet design, Robert Allen, KasLen, GreenHouse, Pindler and Pindler, Kasmir, and others. The design possibilities are infinite. Trim, bullion, tassels, and fringe in a medley of colors and hues are lined up in overhead shelves. Retail, design trade, and commercial projects in various stages of completion are piled on worktables and cubbies. It is a playground for both the most adept designer and the person who is creatively challenged. Concerning the later, don’t worry; expert guidance is available from a gracious and willing staff that will assist you in every aspect of your design project. 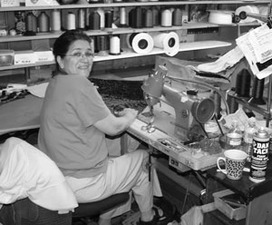 Foam’n Fabrics began life in Bellflower in 1969. It was wholly owned and operated by a maverick of a woman named Millicent Cook. This is where her sons, Dave and Keith Flisik, worked as boys and learned the business. 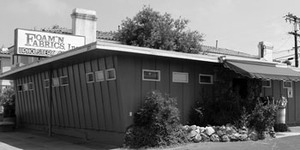 In 1972, Millicent opened the San Clemente location in what was once a cook-your-own-steak barbeque restaurant. When she retired 13 years ago, the sons took over fulltime. Dave runs the San Clemente location and Keith runs the Bellflower location, which is four times larger. Both brothers are enthusiastic about their old-school way of crafting goods and furniture. Dave is proud to point out a worktable - still in use today - that he made when he was ten. Old-fashioned workmanship is a major source of pride for the ten fulltime staffers of Foam’n Fabrics. They exclusively use Alder wood for furniture interiors and cabinets. It’s a hardwood with a close grain that easily takes stains and finishes and stays flexible. Ever notice how antique furniture made of oak will crack? Alder won’t. Alder lumber also comes in a variety of grades for different applications and cost savings. And it’s a fast growing and, thus, renewable resource. Score one for the environment. Using a particular type of lumber isn’t all the good news. All furniture and frame joints are glued and doweled, “like Grandpa used to make,” according to Dave. The list of customers goes on, yet only 30 percent of the business is commercial. The rest is residential with a smattering of special projects. Dave says, “November and December is our busy time of the year. People spruce up for the holidays. After that, we take vacation.” He says “we” a lot and it’s evident he enjoys his job and the employees who work for him. He and half his staff moonlight as security at the Pageant of Masters, “Because it’s fun.” Some have even worked security at the winter Olympics in Salt Lake City and Torino. Many years ago, a San Clemente business group bestowed an award to Foam’n Fabrics for the ugliest sign. Despite this onerous distinction it is a thriving business built on old-fashioned values and a work ethic devoted to quality workmanship.